Five girls. Five different reasons to hate Nolan Hotchkiss. One idea for how they can make him pay for what he's done to them. Nothing too serious; just enough to shatter the illusion of his perfection. But then Nolan is found dead and now five girls have one very big secret. Sara Shepard is the author of the Pretty Little Liars series — which has inspired equal parts devotion and frustration. The devotion is due to the fact that she's a compelling writer, who tightly structures her plots and creates well-developed, complex characters who draw you into their lives. Her mysteries are full of unexpected twists that keep you guessing. 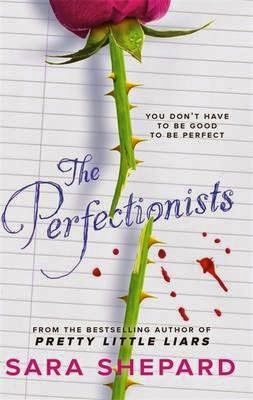 And The Perfectionists is no exception. Caitlin, Julie, Ava, Parker and Mackenzie are not your stereotypical 'privileged rich girls', despite all attending the elite Beacon Heights High School. And the real-world issues of drugs, sexting and physical abuse are all deftly woven into the story to give what is fundamentally a murder mystery an added layer of depth. But be warned. In typical Sara Shepard fashion, there is no neat resolution — hence the frustration she inspires in many of her followers. I read this book over two evenings and almost screamed with annoyance when I reached the end and encountered a cliffhanger of Everest proportions! I will be waiting impatiently for the next book in the series.